I've mentioned in previous posts that American Goldfinches begin nesting around the end of July here in Virginia and that is because they only use thistle down to make their nests. There's something about that "fact" that never settled too well with me, and now I find somebody who has pondered the question well. There may be no connection at all between the Goldfinch and the Thistle Down other than a preference for a soft nest. Thanks Ronald for taking the time to talk to God about this. Bull Thistle (Cirsium vulgare) is often used in photos and paintings with goldfinches. 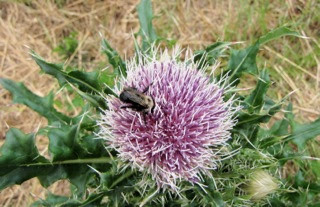 Bull thistle is a widespread biennial thistle originally from Europe and Asia, but now introduced throughout North America. Now if I remember my history, possibly 300+ years have passed since the weeds were introduced along the eastern coast of North America. That means that these noxious thistle plants have been around for maybe 200 years or less for many locations. Maybe 100 years in the western regions of North America. I believe in creation, but that isn't even a blink of an eye, even in evolution terms. So, what did American goldfinches do, or use before thistle plants came along, if it is all about thistle down that is? Are there actually enough thistle plants scattered about to line all the goldfinch nests? What about suburbia where thistle plants may be rare? If plant down is an issue here, why not nest in the spring when there is plenty of down. Anyone that lives near a female Cottonwood tree, knows there is more than enough plant down in the spring to line all the nests in your county or region you live. Wild willows provide down in the spring and countless native plants and weeds provide down as well throughout the season. How can plant down be the reason these birds nest so late in the season? And why do so many promote this belief? Plant down isn't the answer for late nesting at all. It's all about food, period. American goldfinches are 99.9 percent seed eating birds. Virtually everything they eat is some kind of seed. Even newly hatched Goldies are fed a regurgitated mix of seeds. Now then .... What time of year do most plants go to seed? How often do you see goldfinches gleaning from your sunflower heads or your coneflowers? Goldfinches enjoy Liatris, Coreopsis, Rudbeckia, Gaillardia, etc. as well. Late summer offers seeds from Goldenrod, Asters and a host of plants and weeds. Are you getting the picture? So many of our plants and weeds go to seed in mid to late summer, and into fall. Makes sense that our Creator would dovetail the two. If Goldies fed on insects, berries and other stuff like most bird species, they would have different nesting seasons. But they don't ... they are seed eating birds. The same holds true for Cedar waxwings that are heavy berry feeding birds. Waxwings nest later than most, as they require berries for the main part of their diet. Strictly insect eating birds migrate long distances for the bugs. They also leave early to follow the insect trail back to winter homes. The same goes for hummers that feed on nectar and small insects. They follow the food sources. I Love Creation, it is so amazing how God put it all together, without missing a beat. It is silly we we try to explain things any other way. Visit the Gardening For Wildlife Website.